Ngarinyman is an Aboriginal language of the northern Victoria River District in the Northern Territory (Australia). Many Ngarinyman people live in Yarralin, Bulla Camp, Amanbidji (Kildurk) and around Timber Creek. The Ngarinyman to English Dictionary contains Ngarinyman words with English translations, illustrations and detailed encyclopaedic information about plants, animals and cultural practices. Also included is a guide to Ngarinyman grammar and an English index. This volume is ideal for both beginners and advanced speakers of Ngarinyman, for translators and interpreters, and for anyone interested in learning more about Ngarinyman language and culture. 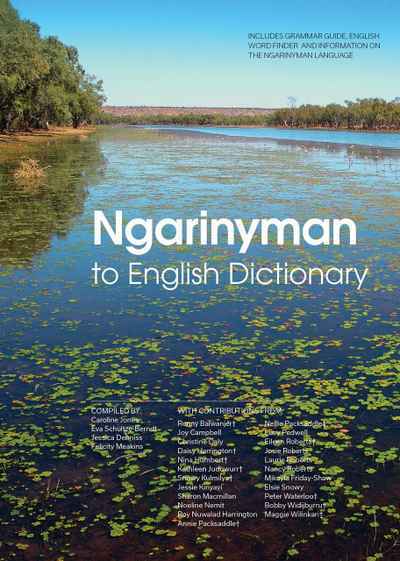 The Ngarinyman to English Dictionary is a part of the AIATSIS Indigenous Language Preservation: Dictionaries Project. This project is a response to the alarming rates of language loss in Australia, and aims to support the publication of Indigenous languages dictionaries. A dictionary contributes to language maintenance, supporting written texts of all genres including important literacy development resources. Dictionaries are a valuable addition to the tool kit of language learners, educators, interpreters and translators. The Dictionaries Project will produce a number of much-needed, high-quality dictionaries of Indigenous languages, which will contribute to community efforts to revitalise and strengthen their languages. The Dictionaries Project is proudly funded by the Department of the Prime Minister and Cabinet.